"B" Shift Crane Mechanics at Highlands Fabricators in 1978. Can anybody name names? Well that's yersel, cousin Duncan, standing on the right on the crane; I think that is Ian Mackay below on the right with his hand on his knee, and is that your cousin, Murdo Finlayson at the front on the left? Recognised as Jackie says Yersel, others? - not a one Duncan. Duncan, correction to my earlier comment - it's not Murdo but Roddy Finlayson? Definately Ian Mackay with his hand on his knee, I've seen this photo at home before! I'm sure he will be able to tell you the rest! Cousin Jackie, you are right and also wrong. It isn't Murdo Finlayson although I must admit it looks very very like him. No, that is Alastair Robertson from Balintore and yes Ian Mackay is there also. 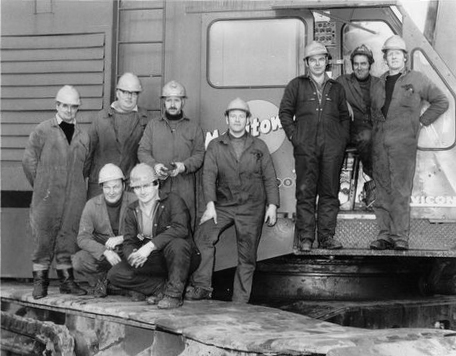 Pictured are from left: John Mcdonald(Helmsdale), Bill Grant(Dingwall), Donnie Patience(Rockfield), Ian Mackay(Invergordon), Don Coghill(Alness), Kenny Kellow(Crane Driver - Dingwall), Duncan Murray(Alness), and kneeling is Alastair Robertson(Balintore) and James Leslie(Dingwall). The chappie in the front row on the right looks like Marcus Leslie.